Interestingly enough I didn’t buy the iPod from Apple directly, I got it through Amazon. Apple must have picked up my details when I synced it with iTunes. It came from MarketResearch@InsideApple.Apple.com and was sent through an Apple server (which is why it is legitimate). Advanis is a Canadian market research firm and other than the URL the survey itself is completely branded by Apple. 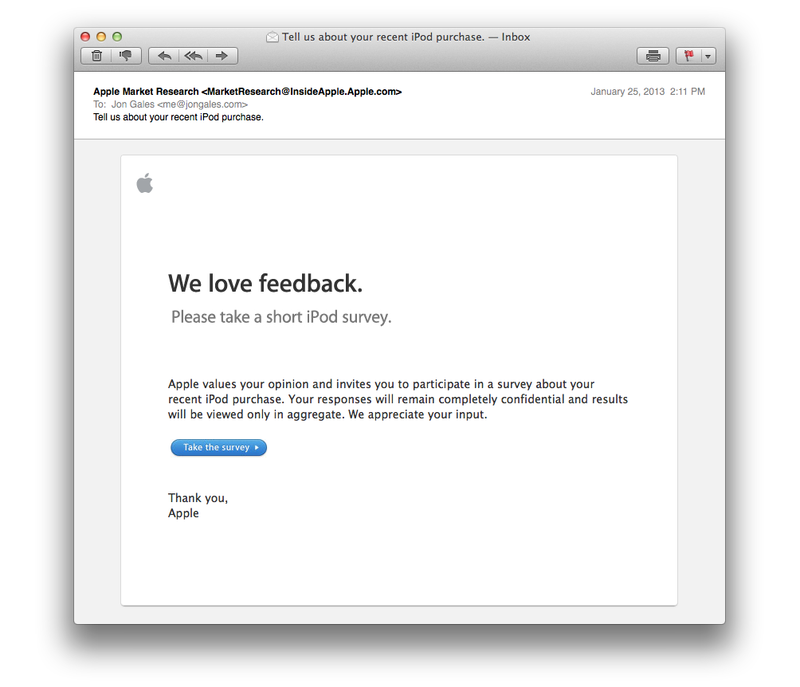 For what it’s worth, I did not take the short iPod survey. If Apple’s reading: I bought it because it’s got a ton of storage and I have a feeling you won’t buy able to buy iPods with this much storage for very long. It’s misleading to say it’s from Apple, that’s what is so phishy about it.